Buying a franchise business involves forming a business relationship to essentially pay for a license to sell a company's products. In short, one company known as the franchisor sells the right to use its business name, brand, and products to another party known as the franchisee. The parties use a franchise agreement to document the arrangements, and the relationship usually has a certain time limit, but the agreement can be renewed from time to time. Buying a franchise involves paying various types of fees including a franchise fee, and royalty and advertising fees. While finding a great franchising business is a difficult task, finding financing for franchising has been proven to be even more difficult. Buying a business franchise often requires heavy investment which many people do not have readily accessible. If you are looking forward to getting in the franchising industry and you have identified a good business for franchising, the cost of acquiring it should not worry you too much, as you can use various methods to acquire the finances you need to start your new business. Just like any other business, finding financing for your new venture can be a headache. However, various options exist that are specifically dedicated to financing franchise businesses. Some franchisors will help new franchisees start their business by waiving the franchising fee. The franchisors can also partner with other lenders such as commercial banks to help new franchisees raise capital for starting their business. If a company agrees to fund its new business partners, it usually indicates this on its official website and also on chapter ten of its franchise disclosure document or agreement. However, it’s highly recommended that you compare the franchisor's financing terms with other sources of financing available to you. Several companies specifically specialize in funding new franchisees. These companies usually match the borrowers with the perfect lenders for their financial need. The franchise financing companies can also lend directly to new businesses. You can arrange to borrow from ordinary commercial banks or credit unions for your new venture. 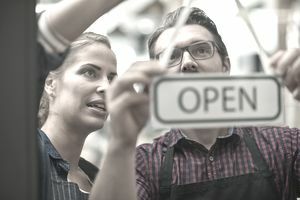 According to the Small Business Administration (SBA), new franchise owners have a higher tendency to borrow from commercial banks than new business owners. Lenders prefer advancing cash to new franchises over other new businesses since they already have trust in the brand and business model of the business being funded. However, despite the tendency of commercial banks to favor franchise businesses, you are still subject to the bank's underwriting and lending policies. The bank still has to review your net worth and credit history to determine whether you can pay back the loan advanced to your business. In some cases, you may also have to provide collateral to secure your business loan. The SBA offers loans for new businesses just as credit unions, commercial banks, and other lenders do. The most common type of loan made to new businesses is the 7(a) loan. New businesses and franchises can access SBA-backed loans by applying through their lenders. As a new business owner who intends to engage in a franchise business, you need to come up with a strategy that will allow you to access financing for franchising. Here are few tips that can help you qualify for a loan. Check the assets you own and determine how much you are willing to put up as collateral. Businesses with enough assets to provide 100 percent collateral for the amount being advanced can access loans easier than borrowers who have lower levels of collateral. You can offer assets to secure your loan in the form of equipment, stocks, home equity, business inventory, cash deposits or savings, property or any other hard asset. However, once you have pledged collateral if your business fails the bank has the right to take the collateral in order to recoup the amount of the unpaid loan. If you are intending to venture into the world of franchise businesses, choose the one that has been registered and approved by the SBA. Once a franchise has been registered by the SBA, the franchise agreement is usually evaluated and approved for use with all of the franchisees. This makes a difference because it helps streamline the process of your loan application, and simplifies the loan application process. Loan applications from franchises that already exist in the SBA registry are often processed faster than other loan applications because the SBA already has the required information for carrying out an evaluation. Business to business companies can usually access financing more easily than companies that deal with consumers directly. In this type of scenario, you can use your clients' invoices to obtain financing from lenders. The process of obtaining cash advances using your clients’ invoices is called factoring. The factor takes the role of collecting the full amount owed to you by your client, then deducts the amount advanced to you and any other fee then pays you the balance. Instead of getting a general loan, you can ask your lenders for financing that pays your suppliers first, rather than just giving you a lump sum of money to use for any purpose. This is useful since the supplier can now ship the products or supplies to your business. This type of financing is known as purchase order financing. If you franchise a highly-reputable business you are likely to have an easier time getting financing. Many lenders have short-listed the franchise businesses they have worked with before and have had no problems with repayments on loans. You can also ask your franchisor to introduce you to lenders who are likely to accept your loan application. Some franchisors help their franchisees with access to loans. This is normally carried out in one of two ways. The franchisor may have a department that guides the franchisees in the process of applying for the loan, or it may have partnered with loan brokers who will help the franchisees access loans more easily. Franchisors may help their franchisees during the loan application and qualification process via a guarantee program. This means that they agree to pay off a certain amount of the loan in case the franchisee is unable to pay it back themselves. The guarantee program helps the franchisees qualify for small loans to qualify for bigger loans.